The oil-exporting South American country is caught in a perfect storm of droughts, food and power shortages, and devastating inflation and recession caused by plummeting crude prices. The outlook for Venezuela appears to be dimming every day, and it's not just because of the country's daily four-hour mandatory blackouts. 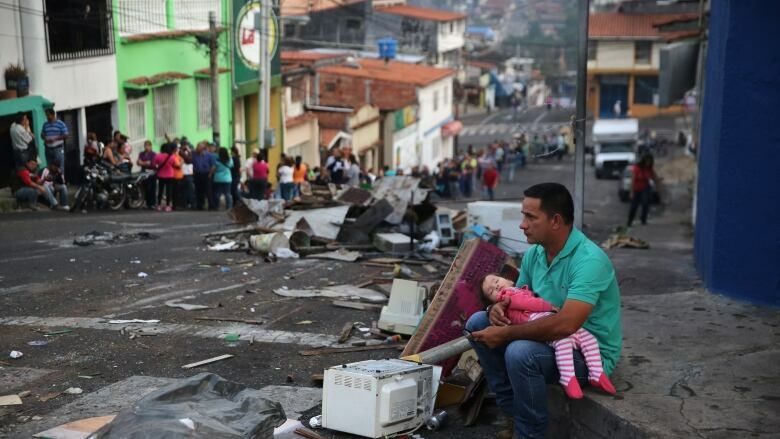 "We're not at war and we're living worse than in a war situation," Becky Jordan, a private school teacher in Caracas, told CBC's The Current. "I really have no idea how much longer people can take this." President Nicolas Maduro, who took over following the death of longtime leader Hugo Chavez in 2013, faces mounting criticism and opposition as he tries, sometimes rather unconventionally, to find a solution. Venezuela, an OPEC nation, relies heavily on oil for export earnings, and plummeting world prices have helped push its state-led economy into a deep recession. "Since Venezuela is about 96 per cent dependent on oil, we're only receiving about a third of the hard currency we were receiving as recently as a couple of years ago," Phil Gunson, senior analyst with International Crisis Group, told The Current. The country also has the highest inflation in the world. Maduro announced earlier this year the strongest of the country's official exchange rates, used for essential goods like food and medicine, would be changing from 6.30 bolivars to the U.S. dollar to 10 bolivars to the dollar. But on the black market, a U.S. dollar is worth about 1,000 bolivars. Along with the currency devaluation, Maduro raised premium gasoline prices — for the first time in 20 years — from 0.1 bolivar a litre to six bolivars per litre, and regular gasoline will jump from 0.07 bolivar to one bolivar per litre. In Canadian terms, that's about $1.29 per litre for premium, and 22 cents a litre for regular. While Maduro has blamed the downturn on an "economic war" he claims is being waged against his government by the political opposition, the private sector and Washington, his critics have slammed the president for sticking to Chavez's socialist blueprint instead of embracing free-market reforms. "Within 2½ years, Maduro has taken an unsustainable [economic] model and just ridden it right off a cliff," David Smilde, a senior fellow and Venezuela expert with the Washington Office on Latin America, previously told CBC News. "People are having a very difficult time." Venezuela's economic woes are exacerbated by water and electricity shortages. 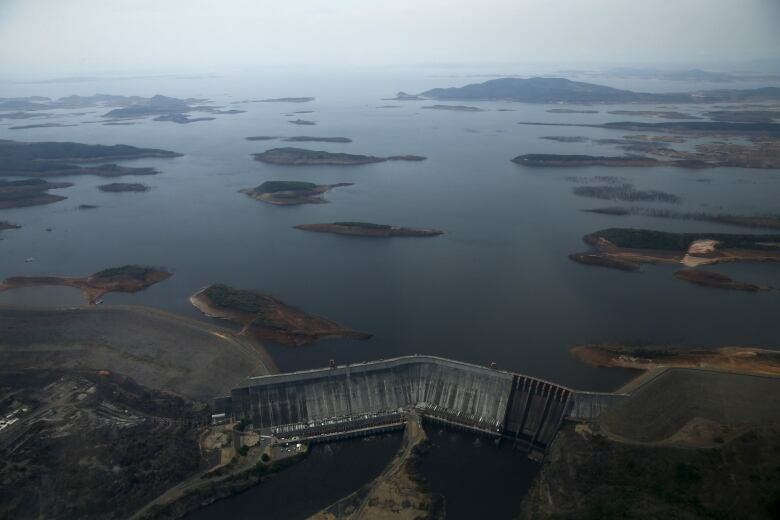 The Guri Dam in the southeastern state of Bolivar, one of the world's largest, has seen unprecedented low levels of water, hitting a record low 243 metres in April. ​The reservoir supplies up to 70 per cent of the nation's 16,000 megawatt power demand, and the government has begun rationing. 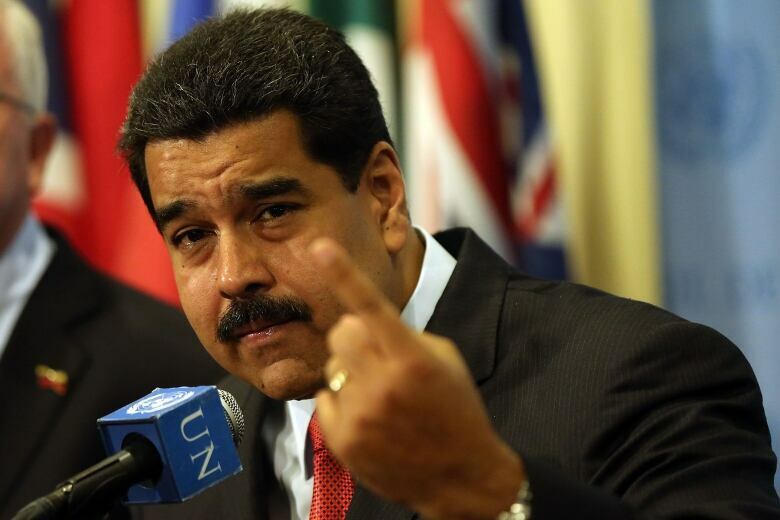 Maduro blames the drought on the El Nino weather phenomenon, but his critics say rationing could have been prevented had the government invested in maintenance and in the construction of thermoelectric plants — power stations that generate electricity with heat energy. Maduro has tried to reduce the country's consumption by cutting back the work week to just two days for 2.5 million public sector employees, instituting four-hour-long daily blackouts across the country, reducing hours in over 100 shopping malls and urging women to stop blow-drying their hair. "I always think a woman looks better when she just runs her fingers through her hair and lets it dry naturally," Maduro said in April. "It's just an idea I have." The floundering economy has resulted in a shortage of basic supplies like food and medicine. Teacher Becky Jordan says you have to wait in line for hours for a loaf of bread, and live without essentials like soap and toothpaste. "Daily life has become increasingly challenging, difficult, frustrating, even humiliating," Jordan said. The government only allows people to shop one day a week at state-run supermarkets, with the day pre-determined by ID number. Food shortages have also contributed to a decline in the education system. According to the Venezuela Teacher's Federation, children have missed an average of 40 per cent of class time because a third of teachers skip work on any given day to wait in food lines. 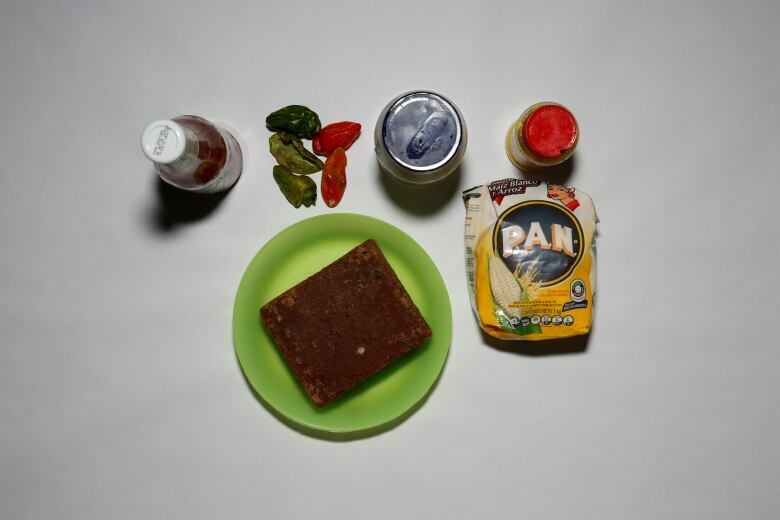 Helena Porras, a school director in Caracas, has asked nearby supermarkets to let teachers cut in line and has disciplined staff for selling students passing grades in exchange for scarce goods like milk and flour. 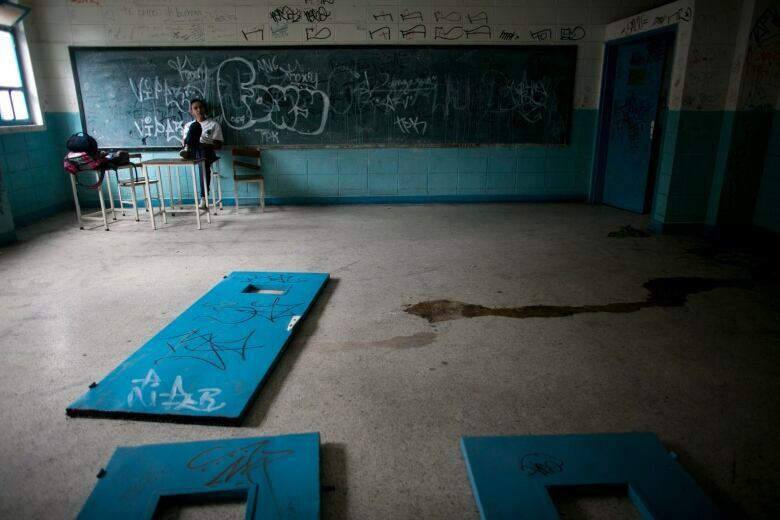 Until recently, Venezuela's schools were among the best in South America, and the late Chavez made education a centrepiece of his socialist revolution. But now teachers are fleeing the country, the annual dropout rate has doubled and more than a quarter of teenagers are not enrolled in school. Maria Alejandra Torres, a hematologist-oncologist in Venezuela, told The Current that the country's health-care practitioners lack basic drugs and hospital supplies, which has resulted in the death of patients with treatable conditions. "We are losing many patients," Torres said. "We don't know how to help them. We don't have a way to help them." Beyond the opposition's formal protest campaign, spontaneous street protests and looting are becoming more common. Some demonstrations have turned violent with National Guard soldiers and police officers using tear gas to counter rock-throwing protesters. 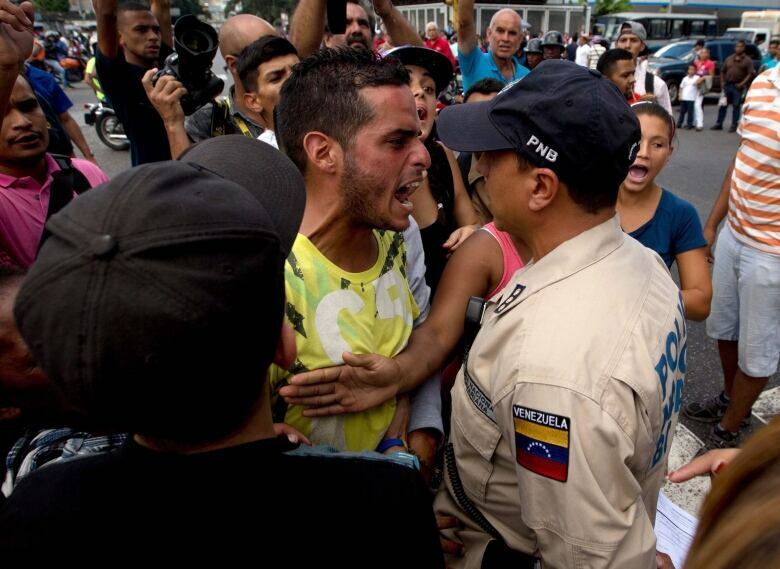 Maduro, a 53-year-old former bus driver who narrowly won election to replace the late Chavez in 2013, accuses Henrique​ Capriles and other opposition leaders of seeking a coup with the help of the U.S. The opposition coalition won control of the National Assembly in December elections, but all the legislature's measures have been shot down by the Supreme Court. The opposition wants a recall referendum against Maduro later this year in order to force a new presidential election. To force a referendum, the opposition would need to gather nearly four million signatures. And if a referendum was held, the president would be removed only if the number of anti-Maduro votes exceeded the number of votes he received in the 2013 election. Officials from the ruling Socialist Party have said there is no time to organize such a vote this year and the election board is dragging its feet over the complicated procedure, which the opposition have denounced as a delaying tactic. With polls indicating 70 per cent of Venezuelans want him out, the odds would be against Maduro in a recall. But if the vote were delayed until next year and he were to lose, he would be replaced by his hand-picked vice-president and the Socialist Party would keep power until the 2019 election.